The United States are often called a nation of immigrants. We warmly welcome those who come to America in their pursuit of a better life. Becoming an American citizen brings a lot of rights and freedom many people wish for. It also brings responsibilities. If you decide to become a citizen of the United States you have to do in a lawful manner. The right way to do so is to go through naturalization. The process of naturalization is the most important step on your way to “American Dream”. To become a lawful US citizen you have to follow certain procedure. You must show a basic knowledge of the US history and government. Once you have established your eligibility you can apply for naturalization. You have to complete Form N-400 and collect the necessary documents. Note that the USCIS might ask for additional information and documents and that may delay your application. So be careful when filling in the Form and provide true and complete information. You will be asked questions about your application at the interview, so save a copy of all your files and documents. Important: The US immigration laws require all Green card and naturalization applicants to be fingerprinted for the purpose of conducting FBI criminal background checks. The most important part of naturalization process is the interview. At the interview a USCIS officer will ask you about your application, your background, your character, your place and length of residence, your attachment to the US constitution, and your willingness to take the Oath of allegiance. You may also be asked additional questions to establish your case. During the interview, you will also pass a test on English and US Civics. You will receive a decision on your naturalization after the interview. Based on the information you have provided, the USCIS can grant, continue or deny your naturalization application. If you receive a positive decision on your application, you will take the Oath of Allegiance to the United States. 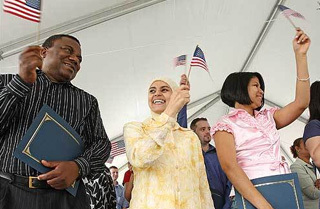 Once you have taken the Oath, you will receive a Certificate of Naturalization that might serve as a proof that you are a citizen of the United States.